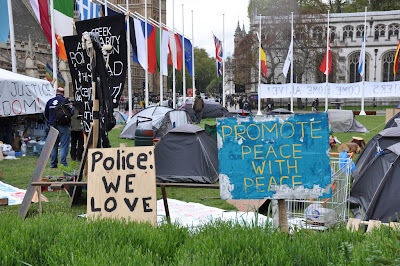 The 'Democracy Village', on Parliament Square, beside the Houses of Parliament inspires mixed feelings. Whilst your author values the right of people to protest, there is a certain arrogance to monopolising the space which has traditionally been one on which everyone can protest, and filling it with unelected people shouting across the road at their democratically elected representatives. Still, what does your author know. It's quite an interesting sight anyway, filled with a ragtag bunch of organisations since the beginning of May, 'campaigning' on a number of issues including peace, the war in Afghanistan, climate change, civil liberties, land reform, electoral reform and 'much more'. We are told that they started their protest following a carnival to mark International Workers Day, at which an unelected 'People’s Assembly' decreed that the War in Afghanistan is at an end. 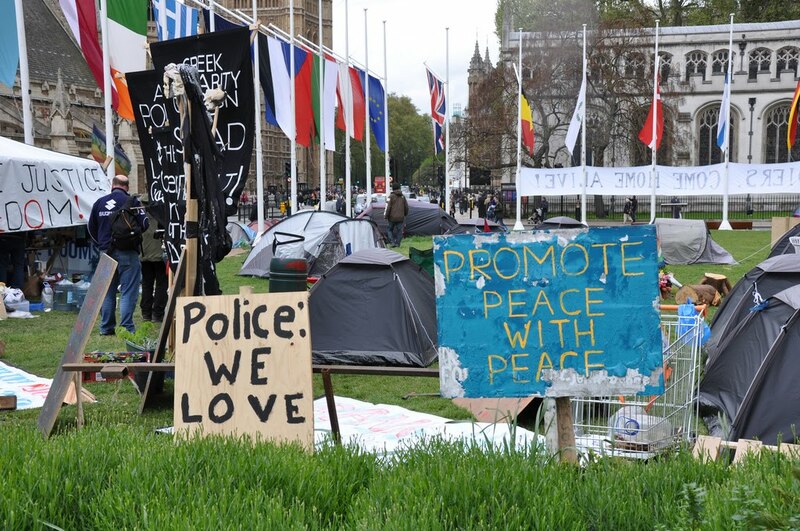 They say they are now occupying Parliament Square to ensure implementation of this 'legislation'. Unlike the people across the road, who were elected in a poll of everyone in the country, in which 30 million people chose to take part, only weeks ago, your author certainly didn't vote for the residents of the village and he doesn't know anyone else that did. It is without even a shred of irony, however, that these people claim they are here for democracy.